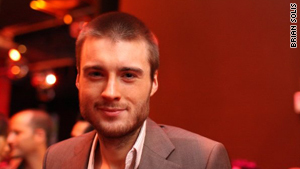 Mashable's Pete Cashmore says getting local could spur growth for Twitter. (CNN) -- Microblogging service Twitter made two major changes in the past week, betting that users are more interested in following their friends, interests and local chatter than in keeping track of celebrities and mainstream news. I suspect the bet might pay off. The concept inadvertently became a great marketing tool: Upon learning that they had hundreds of thousands of followers on the service, celebrities like actor Ashton Kutcher became evangelists for Twitter, promoting it during talk show interviews. Kutcher famously raced CNN to be the first Twitter user to reach 1 million followers -- and won. By concentrating its small user base around a select number of notable accounts, Twitter was able to appear much larger. Just as critical: Twitter's focus on pushing celebrities and news organizations to the fore created an army of free marketers, all perceiving Twitter to be incredibly significant based on the massive popularity of its top users. What's more, new users were connected with big names and brands they already knew. But does Twitter really want to serve up celebrity musings and general interest news, or would it rather provide the most interesting information streams to individuals -- reflecting our interests, perhaps, or helping us to connect with friends and local happenings? Late last week, Twitter provided the answer: Celebrities aren't for everyone. The site's Suggestions section was dramatically revised, replacing a singular rotating list of celebrities, notables and news outlets with a directory of prominent users organized by topic. From business to technology to politics, Twitter users are able to curate their experiences by handpicking their information sources. For new users, this might make Twitter more appealing over the long term. But it may also remove the incentive for influencers to promote the service: Celebrities will see their audiences growing much more slowly than before. Local trends: What's happening near me? Twitter also fosters a sense of community through its "Trending Topics" feature; the top 10 topics on the service at any time are displayed in the sidebar. Often, celebrities lead the charge here too. It's another attempt to highlight what's popular, but are popular topics really the most relevant? The Twitter team thinks it can do better. This week, it rolled out "Local Trends" to all users, meaning these trending topics can be replaced by popular words and phrases in your area. Again, the change triumphs relevance above popularity, a move that may improve retention rates for new users. The downside: Trending Topics were the glue that held Twitter together. Your Twitter experience may be very different than mine. Can relevance improve Twitter's fortunes? The changes take place alongside reports that Twitter's growth has hit a significant speed bump and that the site struggles to retain new users. CNN's Doug Gross analyzed the stats this week in the article "Has Twitter peaked?" pointing out that use of Twitter's site has essentially flatlined. However, the piece acknowledges that Twitter's true growth may be concealed as more advanced users move to accessing the service through mobile and desktop applications. So can more nuanced recommendations and local updates improve Twitter's fortunes? Possibly yes. Location is a major trend for 2010; capitalizing on it is a no-brainer for mobile services. The outcome of the Suggestions change is less clear: Twitter might find that it gains more engaged users while popping its media hype bubble.